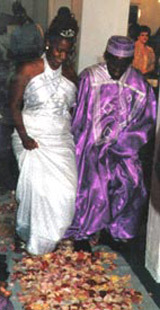 Wedding Dress- African Wedding Gown and Dress | Page 2 of 3 , for Bridal fabric selection or coordination of color samples. Egyptian bride cream and gold embroidery wedding gown. Off shoulder with embroidery neck and full length gown, including matching veil, long trail and bridal crown not shown in the picture (sold seperate). Perfect for bride and bridesmaid at an amazingly low price! 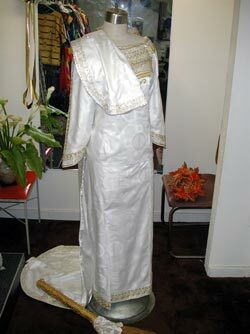 (Available in most colors-Cream, White, Offwhite, Belge, Black, Purple all with gold embroidery and sizes XS - 3X), specify actual size for Perfect fitting. 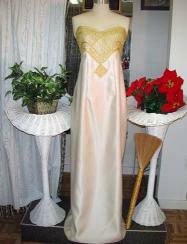 Elegant Silk-Mirror Quality White and Gold George with embroidery Bridal gown, matching Crown or Train sold separately. Perfect for Bride and Bridesmaid (Available in most colors-Cream, White, Offwhite, Beige, Black, and Purple all with gold embroidery Sizes (XS - 3X), specify actual size for Perfect fitting. Made by Wilsdom Designs. Elegant Silk-Mirror Quality brocade cream and gold embroidery bridal gown, matching embroidry gele headwrap or crown and a full length train sold separtely. Perfect for Bride and Bridesmaids (Available in most colors-Cream, White, Offwhite, Beige, Black, Purple all with gold embroidery and sizes XS - 3X), specify actual size for Perfect fitting. At Wilsdom Designs, we provide elegant Afrocentric Bridal and Formal Wear. We custom design Wedding attire for Brides, Grooms, Bridesmaids, Groomsmen and other members of Bridal Parties.Our wedding gowns range from $350.00 and up. Our Gown featured, African Wedding Gown-Cream Gold Lace African Top with Skirt, has Crowns Sold Separately. You may contact us toll-free number 1-510-636-9061 or e-mail us at [email protected], for Bridal fabric selection or coordination of color samples.